Artemisia Trinity supports the body’s natural ability to fight parasite while also supporting the immune system. It aids in healthy cell repair and supports the liver. 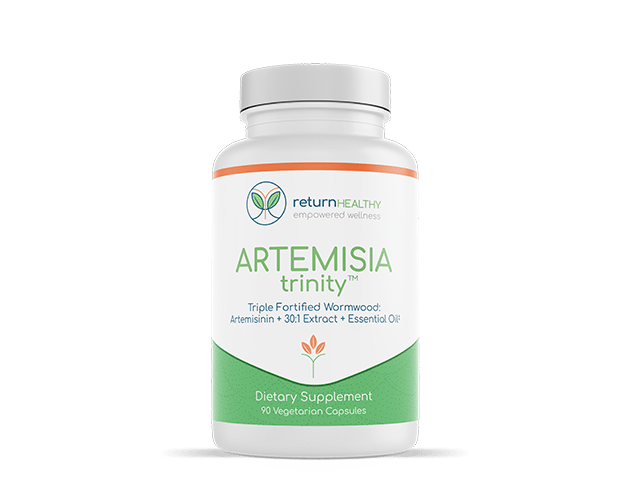 Artemisinin (from Artemisia annua) 125 mg, Proprietary blend: 417 mg, Sweet Wormwood Herb Powder (Artemisia annua), Sweet Wormwood Herb Extract 30:1 (Artemisia annua), Artemisia annua Essential Oil (40% Ketones), Bioperine (Black Pepper Extract, Piper nigrum). Directions for Use: Take 1-3 capsules orally 2-3 times per day for 3 consecutive days per week, with or without meals, or as recommended by your health care provider, as a dietary supplement. Other Ingredients: Vegetable Cellulose (from Capsule Shell), L-Leucine, and Silicon Dioxide.